We'll have a brief moment of smiles before hell breaks loose. Well, wonder no more whether Ezekiel is up to no good, right? 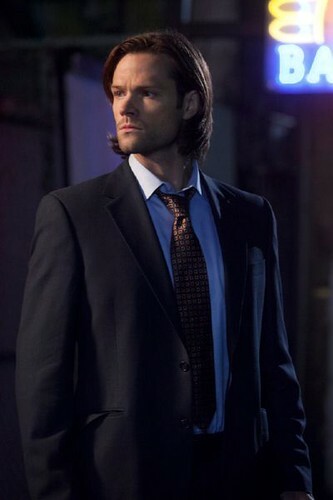 After nearly half a season with Sam possessed by an angel, things finally came to a head in tonight's episode with some double whammy reveals, which is what a mid-season finale should be, I suppose. That's right, it's the end of new Supernatural episodes until 2014, people. So, after all of the angels were cast out of Heaven, basically two different factions began to form. One following Bartholomew, and one, we find out tonight, following Malachi. I hope I'm spelling that right. Anyway, these two factions are now at war with one another, killing each other off. Both want to rid themselves of the other side and somehow get back in to Heaven and rule, blah blah. Lots of angel stuff tonight. After one group ends up dead, Sam and Dean go to investigate, despite AngelSam not wanting to go get involved with angel stuff. 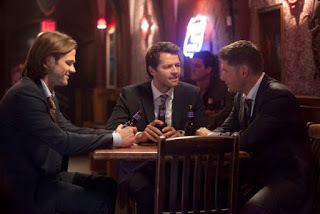 They meet up with Cas, who wants to get back on the team and start fixing what he essentially helped cause, however unwittingly. Alas, their reunion is short-lived, as once again AngelSam makes a stink about being near Castiel. Why Cas doesn't question this more, I'm not sure, though I guess he can't quite tell when Dean isn't telling the entire truth yet. Duped by an Angel, next on The CW. But it turns out AngelSam, aka Zeke, aka WHAT, turns out not be Ezekiel after all! What! That's right, whammy number one of the night happens when AngelSam is visited by Metatron, who can apparently travel between Heaven and Earth at will though no one else can? Anyway, he reveals that Sam is in fact possessed by Gadreel, an angel that had been locked up in angel jail before the purge. Metatron tells Gadreel that he would like him to join his new Heaven. Oh great. Meanwhile, Cas tries to pray a bit to a nice angel, and actually does get one to come to his aid, only to be taken by Malachi's group. Malachi wants to know what he knows about Metatron, blah blah, even though Cas can only say so many times that he was a patsy. In any event, one of Malachi's minions left to torture Cas to death flips and says he wants to let Cas go if he can get on Metatron's good side for this new heaven. Cas plays along and, um, slits his throat and steals his grace? This is a thing that can happen now? So I guess Castiel is now all angel-fied again? That seemed rather easy and weird, and a rule conveniently made up so we could have Cas back at full power to help things along. While he's there, though, he hears that a bunch of angels actually died while falling from Heaven, and one of them happened to be Ezekiel. Wait, whaaaa? Cas calls up Dean to tell him this bad news, which is very bad indeed. He goes to Kevin for help in trying to find a spell that will let him talk to Sam without the angel inside hearing him. Poor Kevin gets bossed around a lot this episode by Dean, who will surely feel very guilty about him for many moons to come. This is my suspicious face. While they do find a spell, and Dean does tell Sam about his hosting an angel, and Sam gets appropriately upset, it turns out that it was Gadreel faking to be Sam all along, as he heard the conversation between Dean and Kevin earlier about the spell. So what does he do? He KILLS KEVIN! What! This was on Metatron's orders, who told him, after he agreed he wanted to be part of the new Heaven, that he had to kill some people first, Kevin being at the top of the list. So Gadreel takes off in Sam's body, leaving Dean alone in the bunker to contemplate just how royally he is screwed, and how royally he screwed over Kevin too. Poor Kevin. I honestly didn't really see that coming, though I suppose I should have with the line about him always getting screwed and Dean saying not always. Yes, Dean. Always. - I don't like the making up of rules out of nowhere. At least it could've been mentioned at some point that a grace could be stolen from another angel, because that was a completely new thing. Unless I missed it somewhere along the line, but it seems a pretty major thing to miss if that's the case. - Speaking of which, are you looking forward to angel Castiel being back, or were you enjoying the human version? - You had to know something was up with "Zeke" when he kept saying he was almost done all the time but never seemed to be actually done fixing Sam. I didn't expect him to be another angel entirely, though. 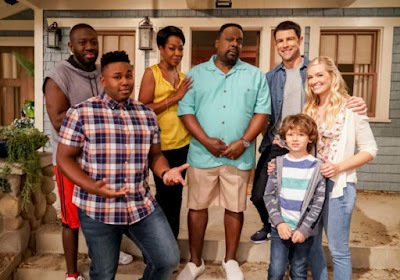 - Another fan favorite guest star bites the dust. Sigh. - Remember when it used to be saving people, hunting things, the family business? Now it's all angel business up in here. - How pissed is Sam going to be when he's safe and actually finds out the truth? Oh boy. - Do you have a favorite episode so far this season? How are you liking the season as a whole? Let me know in the comments! Dean: You're not up to warp speed yet, but you will be. Would I lie? 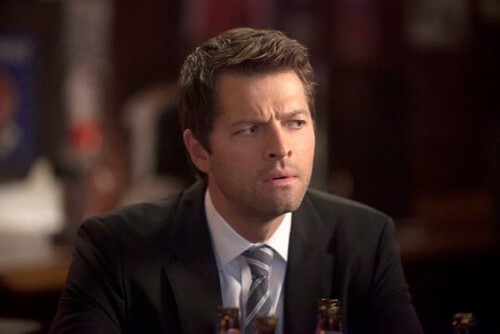 Cas: Hey, Cas is back in town. Cas: So hot. And very nice...up to the point she started torturing me. Dean: Yeah, well, not every hookup is perfect. Metatron: And no more stupid angels. Maybe some funny ones. Kevin: Everyone always needs a spell and it's always ASAP. Kevin: I always trust you, and I always end up screwed. Dean: Oh come on, always? Not always. That was a cool find on Wikipedia - and will surely have some fans' heads reeling - but I think it's spelled Gadreel. Type that in, and you'll get a very different response, probably the one the writers were going for. Yeah I changed it. You must've had the page opened from before I updated, haha. But still kind of funny that the misspelled version heads to Azazel. So way back when, in season 4, Uriel stole Anna's grace. I know he stole it from a tree and only wore it around his neck, but I wonder if this sets the precedence for thieving graces. Did Metatron have to use some ritual/spell to steal Castiel's grace? Or did he just slit Cas's throat the same way. I'm with you, I knew the angel would never give up Sam but I was completely blindsided by it being another angel. I think my favorite episode so far this season would be "Heaven Can't Wait" or "Bad Boys." I don't know, I think when it's all said and done and I look back over season 9 and rewatch I will probably like it a lot. Right now I'm on the fence. Hmm. That's right. But they never talked about stealing another's grace and using it for themselves. If all you have to do is slit an angel's throat to steal its grace, I'm surprised it hasn't happened more often. Also, if you are from the right bloodline, or whatever, and are just a normal human, can you steal an angel's grace and then become an angel? Or does having a soul make that impossible? Good question. It seems like it shouldn't be possible, but then if Cas was really human then technically he wouldn't be able to either, though I guess being a former angel makes a difference. I swear at one point it was only angels who could wield the angel blades as well, but that obviously changed, and maybe I just inferred that when it was never specifically stated at first. Hmm. So many questions!